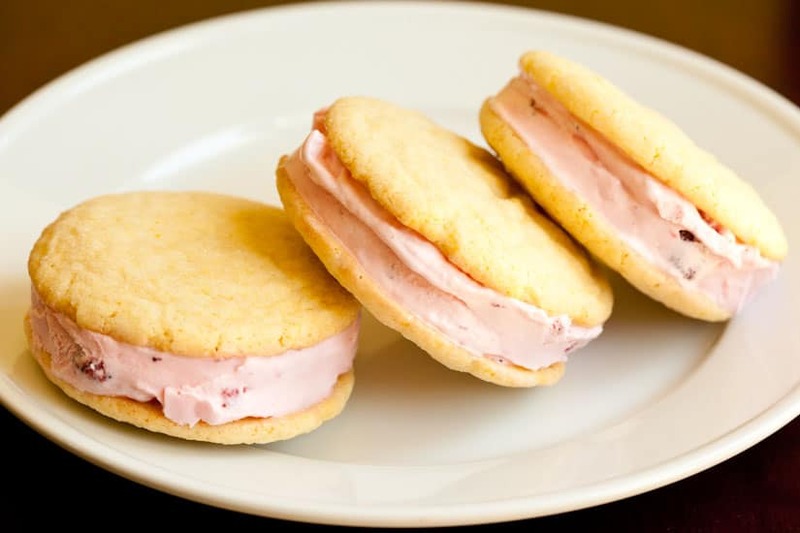 These delicious strawberry lemon ice cream sandwiches are made from big homemade lemon sugar cookies and filled with strawberry ice cream—a perfect summer treat! Did you know that July is National Ice Cream month? Apparently Ronald Reagan proclaimed July 1984 to be National Ice Cream month and the tradition has continued since then. I suppose it makes sense that the hottest month of the year goes hand in hand with the coolest treat around, but I hadn’t really heard of National Ice Cream month until I was contacted by Tillamook to see if I was interested in playing with some of their ice cream to create a treat to celebrate this special month. 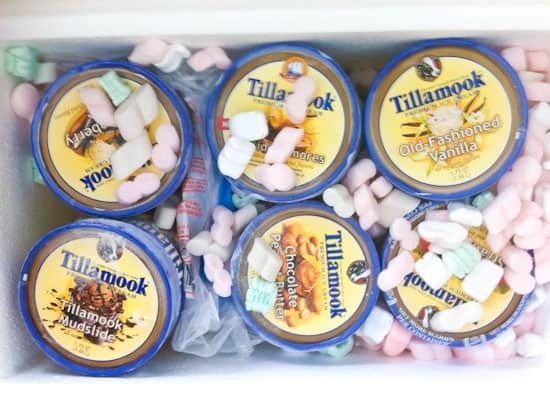 I certainly don’t need an excuse to consume ice cream in the summer, but it was a lot of fun sampling some new Tillamook Ice Cream flavors and coming up with an ice cream treat to share with my family and with you. Just look at what arrived on my doorstep! SIX different flavors of ice cream. I didn’t have room in my freezer for these so I took them over to my grandparents to store in their extra freezer and to share with the rest of my family. Everyone stops to visit Nana and Grandpa regularly! The flavors we had to sample were: Old Fashioned Vanilla (my grandpa’s favorite), Oregon Strawberry (Phil’s favorite), Tillamook Mudslide (my Aunt Kathy’s favorite), Marionberry Pie (one of my favorites), Chocolate Peanut Butter (my other favorite), and Fireside S’mores, which everyone seems to like. It’s been a good month of ice cream. I decided I wanted to end the month with some cookie-based ice cream sandwiches and as I was browsing through the cookie recipes on Pinch My Salt, I ran across these Giant Lemon Sugar Cookies that I made years ago. I thought they would be perfect for an ice cream sandwich! Since lemon and berries go so well together, these sandwiches would have been great with either Oregon strawberry or the marionberry pie ice cream. I decided to make strawberry lemon ice cream sandwiches just to keep the flavors simple and straightforward. Since I had never frozen these lemon sugar cookies before, I wasn’t sure how they would work. There’s nothing worse than an ice cream sandwich that’s too hard to eat! But the lemon cookies worked great. Even after sitting in the freezer overnight, the cookies were firm but easy to bite through. Everything holds together well and the strawberry lemon ice cream sandwiches were a big hit with my family! Disclosure: Tillamook provided me with free ice cream but I was not compensated in any other way and all views expressed in this post are my own. 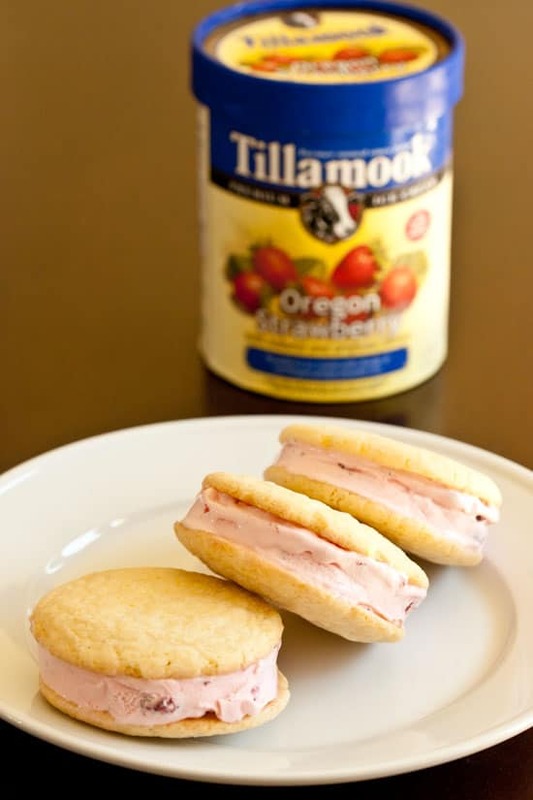 I love Tillamook ice cream (and cheese :)), and I've been wanting to make my own ice cream sandwiches for a while! These look absolutely awesome! What great flavor combinations. I never have had Tillamook but now I'm dying to try! These sandwiches look delicious! YUM! I'm so excited they're producing ice cream. I bet it's just as delicious as their cheese! I had NO idea that Tillamook made an icecream! I bet it's fabulous, it would really have to be. You can't take a brand like that, with all the expectations and then put out something less than amazing.I'm officially excited. I had no idea that Tillamook made ice cream either? When did they start doing that? No matter I will find some tonight when I go shopping. The ice cream sandwiches look totally delicious and just the right idea for the hot days we are having here in Las Vegas. We are getting up to 117 degrees and up to 60% humidity so your ice cream sandwiches are a total winner! These look awesome - so delicious! I always thought of Tillamook as cheese...that ice cream looks great! I need this in my life immediately. Gorgeous! Wow. That looks so yummy. Hats off for the creativity! I just wanted to say that is the most delicious thing i have seen in a longg time...im savin this recipe for good i cant wait to bite into this. Great post and ill read more from you in the future! Loved it! Another great way to eat ice cream. Thank you for this awesome post. Is it okay to use orange instead of lemon? Lovely recipe, yummy mouth watering ice cream sandwiches. These look so yummy - cannot wait to try them and to be honest, I reckon I could eat them all year round!! Those ice cream sandwiches look scrumptious! I love your blog. I have a food blog about cooking on a boat circumnavigating the world called Sally in the Galley www.sallyinthegalley.net I would love to hear what you think! *sigh*, wishing we had a better/bigger freezer on the boat. This recipe looks delicious and your photo's are excellent. I have just started my own blog and I hope that I can one day make it look as good as yours. My crushing disappointment with ice cream sandwiches is that I always break at least one cookie as I smash down on the ice cream. :( These look so good! Those ice cream sandwiches look really nice!! Lemon Sugar cookies remind me of my grandmother's cooking. There is nothing like waking up to the smell of fresh baked sugar cookies! Add some strawberry ice cream inside and - wham, heaven.